Mature and debonair. On introduction an impression of blackberries, warm musk and cherry tobacco. With better aquaintance plums, rasberries and liquorice wrapped up in worked leather and a thought of caramel. Share the experience with a chateaubriand, mushrooms and pommes puree. 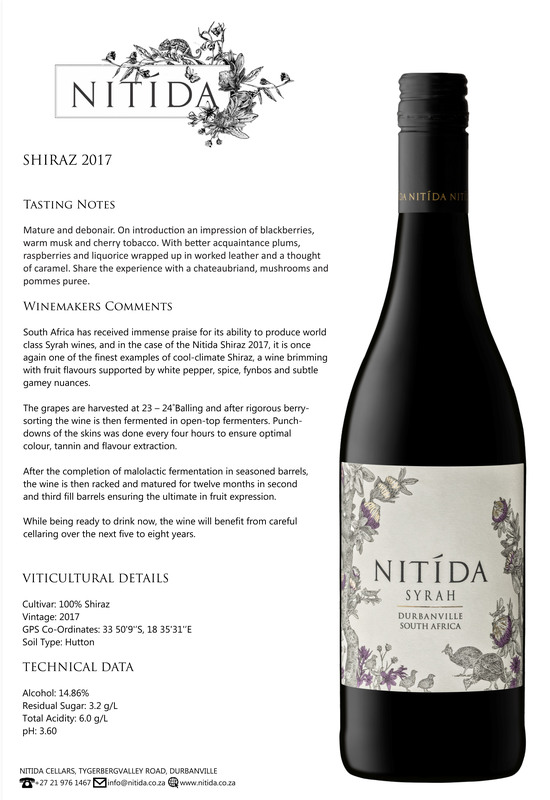 South Africa has received immense praise for its ability to produce world class Syrah wines, and in the case of the Nitida Syrah 2016, it is once again one of the finest examples of cool-climate Shiraz, a wine brimming with fruit flavours supported by white pepper, spice, fynbos and subtle gamey nuances. colour, tannin and flavour extraction. After the completion of malolactic fermentation in seasoned barrels, the wine is then racked and matured for twelve months in second and third fill barrels ensuring the ultimate in fruit expression. While being ready to drink now, the wine will benefit from careful cellaring over the next five to eight years.